Collecting Antique Clocks: Benjamin Stribling and William Goodwin - Stowmarket’s first clockmakers. Collecting Antique Clocks Benjamin Stribling and William Goodwin - Stowmarket's first clockmakers. Stowmarket in the seventeenth century was a small town in Suffolk with a market every Thursday. With a population of a little under 2,000 in the parish in 1800, I imagine there would be about 1,000 people living there in the late seventeenth century, hardly enough for a clockmaker to make a living from. But market towns were always a magnet for blacksmiths, and later for clockmakers, since they brought in a population from miles around which far exceeded that of the town itself. Domestic clock making in Suffolk began in the second half of the seventeenth century with lantern clocks, the longcase clock being virtually unknown till almost 1700. The anchor escapement with long pendulum was introduced nationally just before 1680, but, with a few rare exceptions, it was almost twenty years before its use brought longcase clocks into Suffolk, and perhaps the 1720s before it was well known. The lantern clock persisted in Suffolk and in East Anglia generally longer than in most regions and this is consistent with the view that the longcase clock was slow to arrive there. 1. 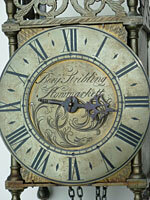 This lantern clock by Benjamin Stribling dates from about 1710-1720 as can be seen by the style of its dial and hand. It is many years ago now since Arthur Haggar and Leonard Miller published their book 'Suffolk Clocks and Clockmakers'. My copy was inscribed by them in 1975 and I still use it regularly. Sadly both of these keen horological researchers died some many years ago now. New details of Suffolk makers keep coming to light, but the fact that the overall picture has changed little in those intervening years is a measure of the thoroughness of their researches. Arthur Haggar had been collecting information about Suffolk makers since the end of World War II, which makes even an old hand like me look like a beginner! The first two clockmakers in Stowmarket were William Goodwin and Benjamin Stribling - the latter by the way seems to be totally unconnected to one or two clockmaking families elsewhere in the country called Stripling. We do not know where either of them came from. Goodwin seems to have been the earlier of the two. He was long assumed to have been the man of that name, who was apprenticed in London through the Clockmakers' Company in 1675 to John Harris, but that seems to me very unlikely for several reasons, not least that he was recorded as working in Stowmarket as early as 1681, when the London man would have been only twenty years old and still unqualified. In fact Goodwin is not an uncommon name in Suffolk. William Goodwin paid rates from1681 to 1688, for the last few years of those at least he was stipulated as being in the Market Place, the ideal location for a clockmaker. He died in 1733 or 1734, being dead by October 1734. 2 .The decorative scrollwork, signature lettering, lozenge half-hour markers, hatched corners are all done in a simpler manner now than at earlier times and offer evidence of the date of making. Benjamin Stribling was thirty years old when he was married on the 16th July 1693 to Elizabeth Lucas, aged twenty. He could have been working as early as 1684, but if he was, then we don't know where. We can take it he was born about 1663 but his birth has not yet been located. Haggar and Miller say Benjamin had four children baptised between 1695 and 1709. Benjamin was buried on the 17th April 1720 aged about 57; his widow many years later on the 15th September 1754 aged 81. A longcase clock is recorded by Benjamin and several lantern clocks, of which I know of about four. William Goodwin is known for several longcases and also several lantern clocks and a bracket clock. I know of eight lantern clocks by Goodwin. Of these lantern clocks all had anchor escapements except one by Goodwin had a verge pendulum. We might expect this, as Goodwin was there first, but it is also a measure of the late arrival of clocks in Suffolk, in that the anchor escapement was well established by the time they arrived there. As Goodwin was in business for 52 years against Benjamin Stribling's 27, it is not surprising that much more of Goodwin's work seems to have survived. 3. 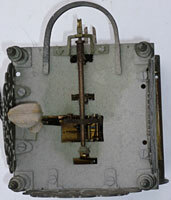 View of the top plate showing the original anchor escapement. A previous owner has covered the hammer head with a leather hood to soften the sound. One interesting aspect is that Goodwin and Stribling must lived for a period of at least twenty-five years working, we assume, in rivalry against each other. They must certainly have known each other. Would Stribling have moved into that small town to set up business knowing he had to compete against a man already established there for some ten years or more? Seems a bit of a risky venture. I cannot imagine Goodwin was very pleased to have a competitor set up in the same town, where he had previously had a monopoly of the clock and watch trade. Unless of course Stribling began his life there working as an apprentice or journeyman for Goodwin before he branched out on his own. No apprenticeships seem to be recorded for either man, either of his own serving or of any apprentices he might have taken. But then only those on which a tax was paid are recorded nationally and it is quite possible that some dusty apprenticeship indentures relating to them may lie in a parish chest or record office somewhere, as yet unexamined. That Stribling worked at first for Goodwin seems to me a likely eventuality, but we may never know.